Spending the day in Rome? Well grab your walking shoes because you’ve found the perfect itinerary. 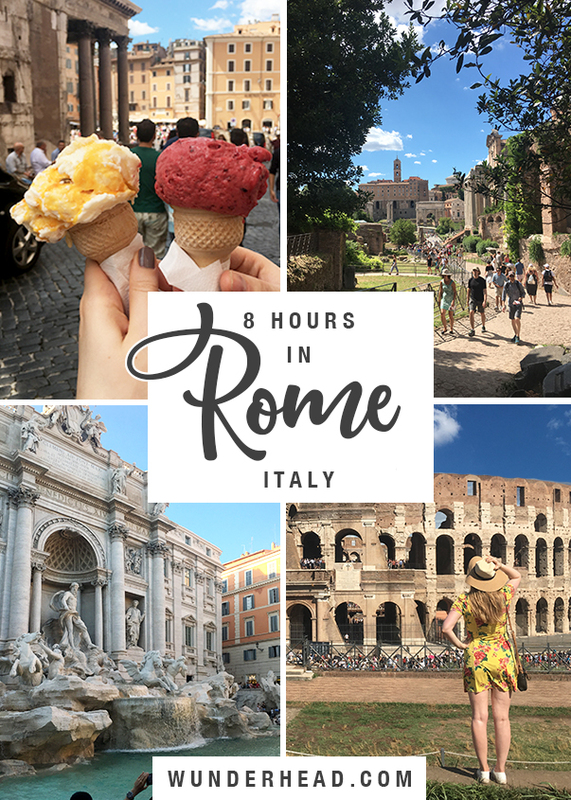 This route will tick off the Pantheon, the Altare della Patria, the Roman Forum, Colosseum, Trevi Fountain and Spanish Steps, and leave you two hours for dinner at the end. Map by Google, route by Emma. How did we plan our route? 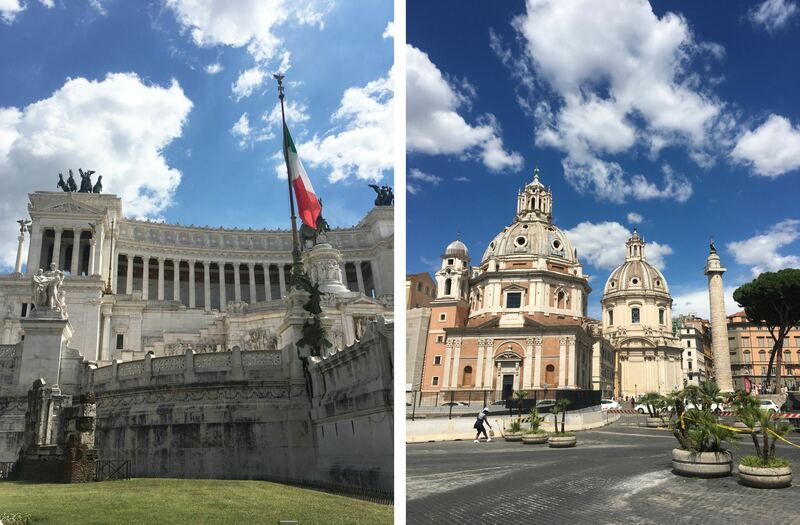 As there was such a large group of us, we all made a list of monuments that we wanted to see in the city, and people-hurder and planner extraordinaire Emma plotted the points on the map so we could join the dots and created the perfect Roman day trip. Start your day in Rome the right way, at Super Pizza on Via Giustiniani. They cut you two slices from a big tray and parcel it up in greaseproof paper so you can eat it like a sandwich. The base was gloriously crispy and warm, with perfectly seasoned toppings – this was seriously some of the best food we had all holiday. Left: Lunch from Super Pizza. Right: Piazza della Rotonda. First up is the Pantheon, a former Roman temple that’s now a church, on the site of an even older temple that was built in 27 BC. 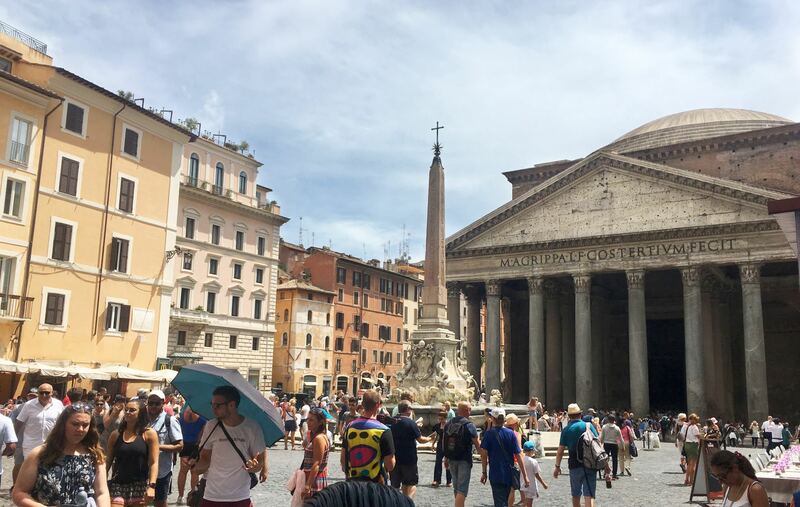 That burned down at some point in the first or second century AD and was replaced by the current Pantheon, an imposingly large building that dominates the square around it, the Piazza della Rotonda. Piazza della Rotonda with the Fontana del Pantheon. Compared to the colosseum or to any of the other churches in Rome, you might be wondering what makes this one so special. 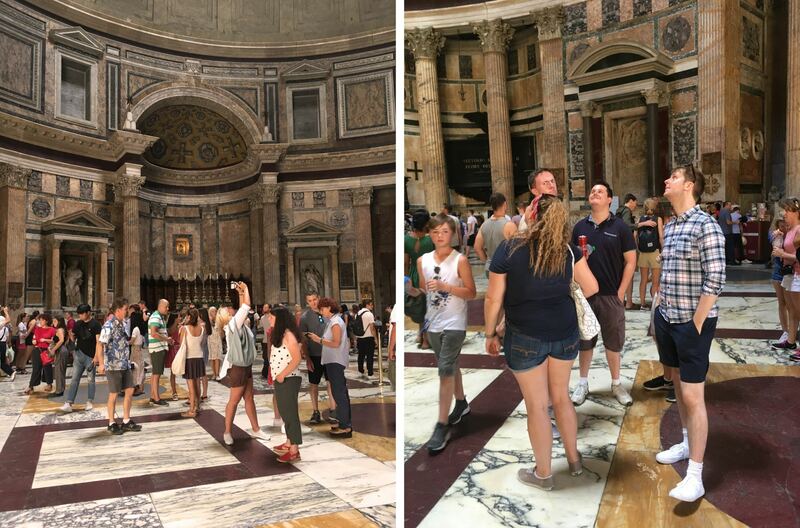 In fact when I did a poll of our group at the end of the holiday, the Pantheon came out as most people’s favourite attraction! Could it be because of the enormous dome, still the largest unreinforced concrete dome in the world even 2,000 years after it was built? Could it be the dramatic checkerboard marble floor pattern? Well no because it’s obviously the massive hole in the ceiling. 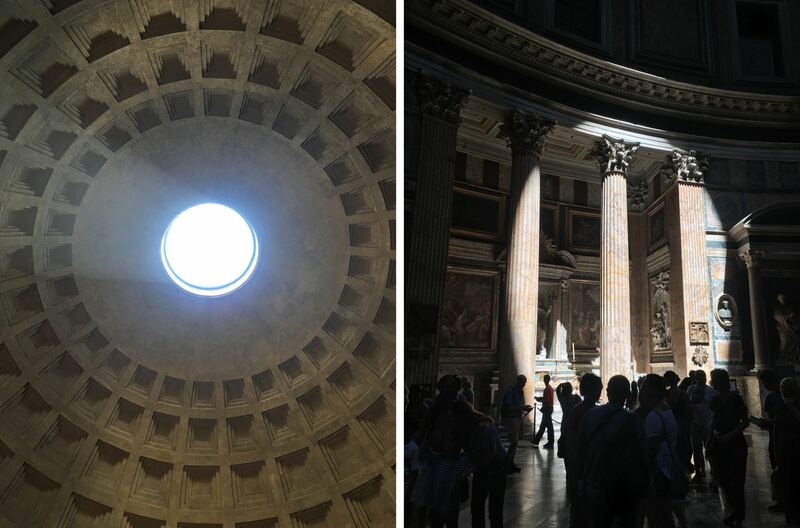 The “oculus” of the pantheon is 27 feet wide, and is a natural source of light inside the dome. The best part is that the bright beam of light that falls through the oculus moves around the interior throughout the day, like a reverse sundial. Left: The oculus in the centre of the dome letting through a beam of sunlight. Right: The sunlight from the oculus falling on the first chapel to the left of the entry. Add the fact that the Pantheon is free to enter, and I’d say that makes it well worth the trip, wouldn’t you? Especially if you treat yourselves to some gelato after your visit. 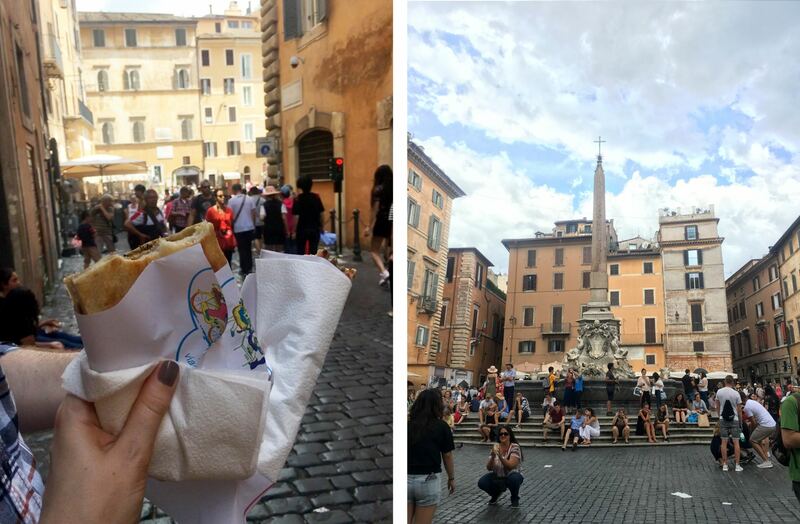 In fact, I highly recommend that you do, to fuel yourself up for the walk to the Roman Forum. Left: Dome selfie. 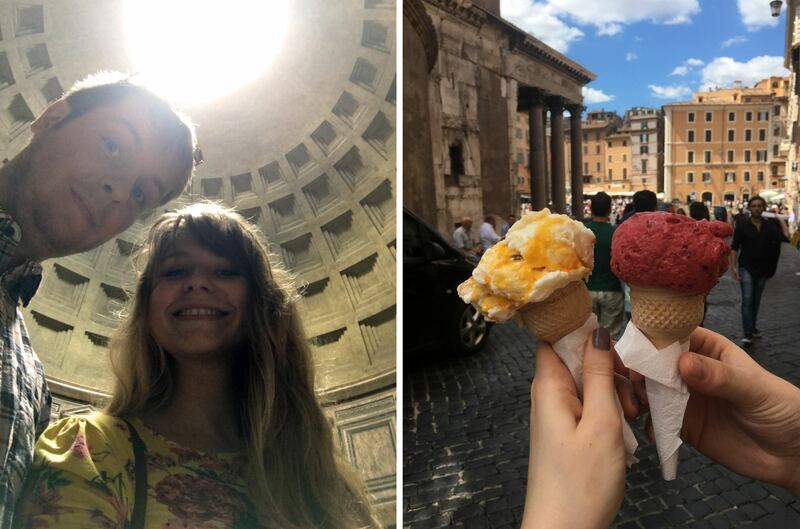 Right: Gelato outside the Pantheon. 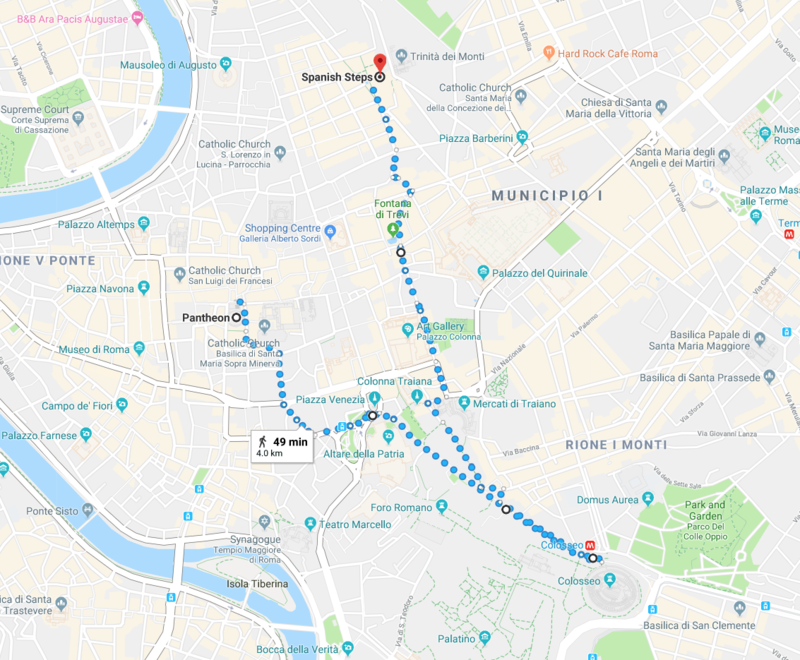 On your way to the Roman Forum you’ll cross Piazza Venezia, where several massive roads intersect encircled by the Palazzo Venezia, the Church of St Mark, the Church of the Most Holy Name of Mary, and most prominent, the Altare della Patria. Altare della Patria, or Altar of the Fatherland, also known as the Monumento Nazionale a Vittorio Emanuele II. 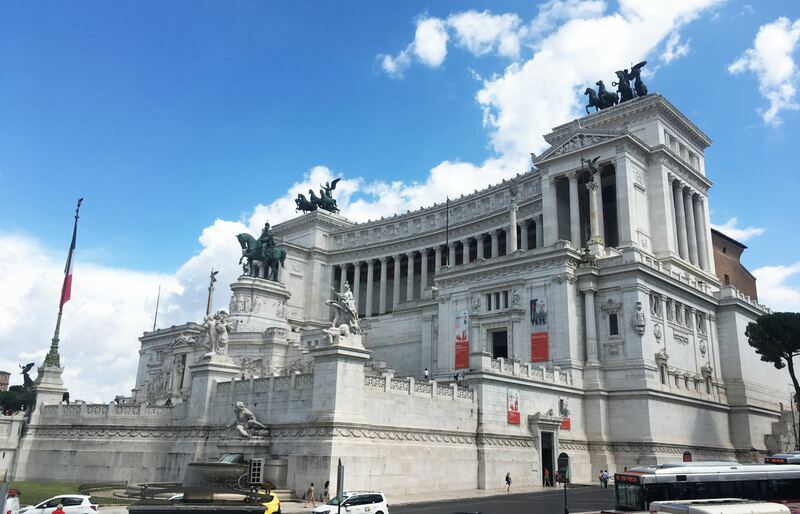 This huge monument is relatively modern compared to most of the sights in Rome, built in the early 20th century in honour of the first king of unified Italy, Victor Emmanuel. It covers around 17,000 square metres and reaches to 266 ft high including the statues, and with all the stone horses, columns and fountains, you can easily see why it’s often dismissed as pompous. Left: Altare della Patria. Right: Chiesa SS Nome di María. 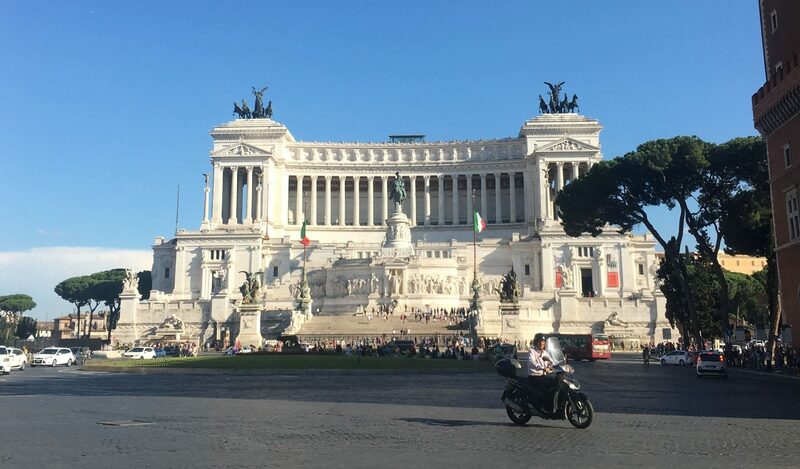 Its height means it can be seen from most parts of Rome and the glaring white of the marble makes it stand out conspicuously from the surrounding brown architecture. Its local nicknames include la torta nuziale (“the wedding cake”), la dentiera (“the dentures”), macchina da scrivere (“the typewriter”) and la zuppa inglese (“the English trifle”) – none of which are meant to be complimentary. Altare della Patria from Piazza Venezia. A section of the monument is dedicated to the Tomb of the Unknown Soldier, holding an eternal flame as a memorial to all the unidentified soldiers after World War I. If you’ve been to Paris, this is similar to the Tomb of the Unknown Soldier and eternal flame under the Arc de Triomphe. 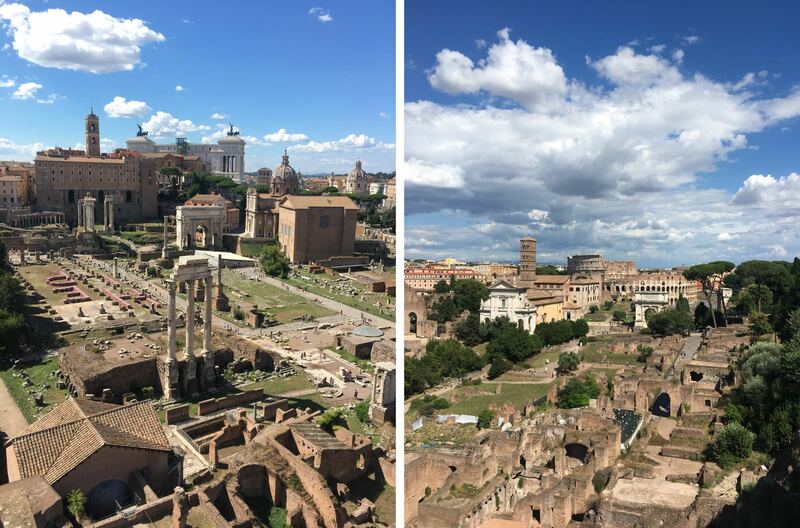 The next major sight to see is the Roman Forum, stretching between the Altare della Patria and the Colosseum and holding many of the oldest structures in the capital. Left: Chiesa dei Santi Luca e Martina. Right: Altare della Patria. 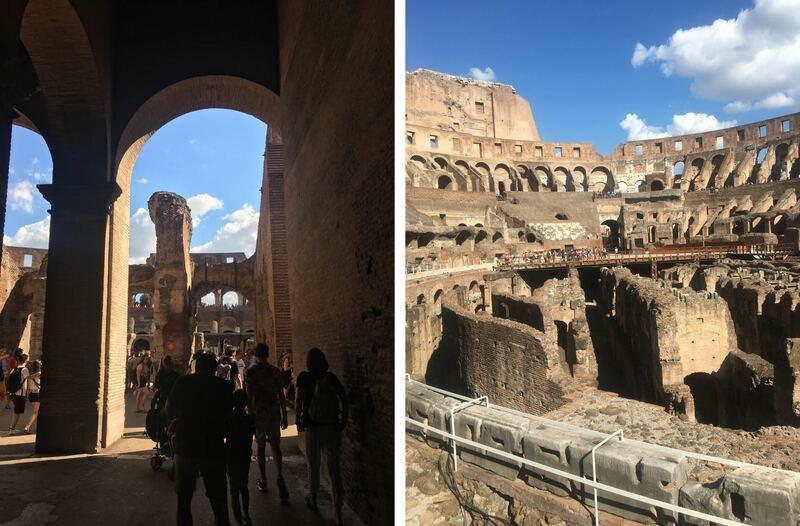 The “teeming heart of ancient Rome”, it would have hosted everything from processions, elections, public speeches, criminal trials and gladiatorial matches, and been the centre of commerce for the city. 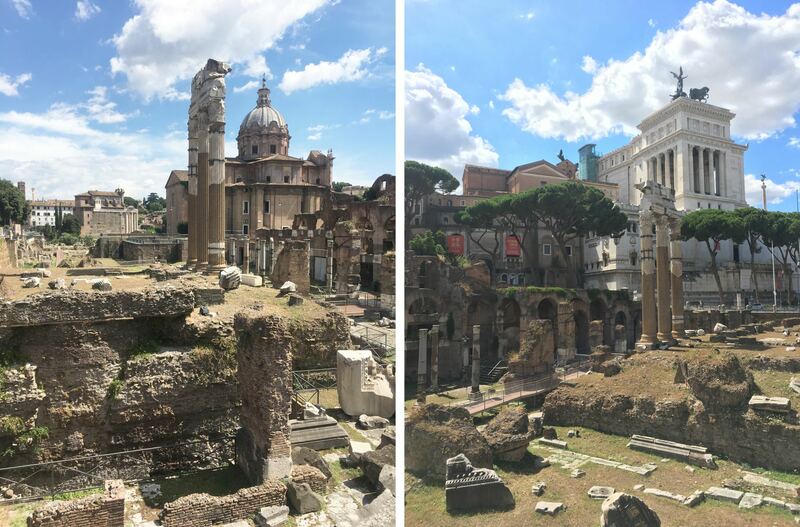 The land around the forum itself is littered with shrines, tribunals, memorials, statues and temples, the most important thought to be the Temple of Saturn which also served as a bank. 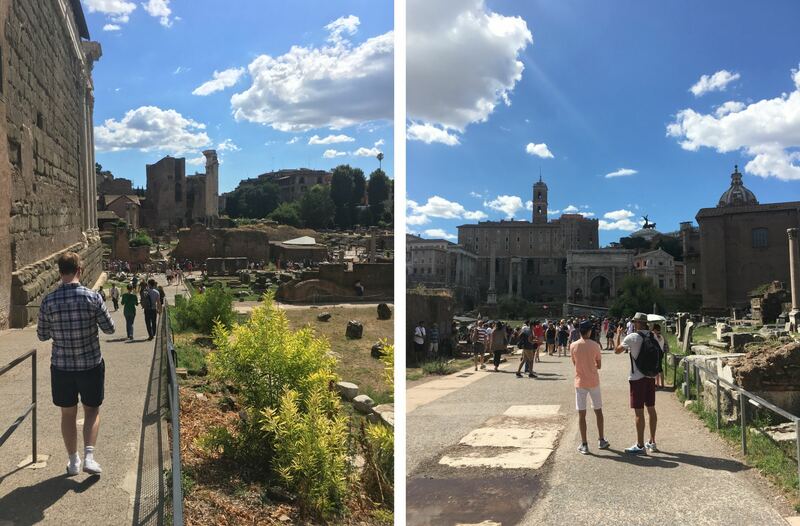 The area you can enter with your ticket includes the Palatine and Capitoline Hills on either side of the valley, the excavations and ruins between them attracting over 5 million visitors a year! Left: Matt entering the Roman Forum. Right: The central walkway leading to the Tabularium. 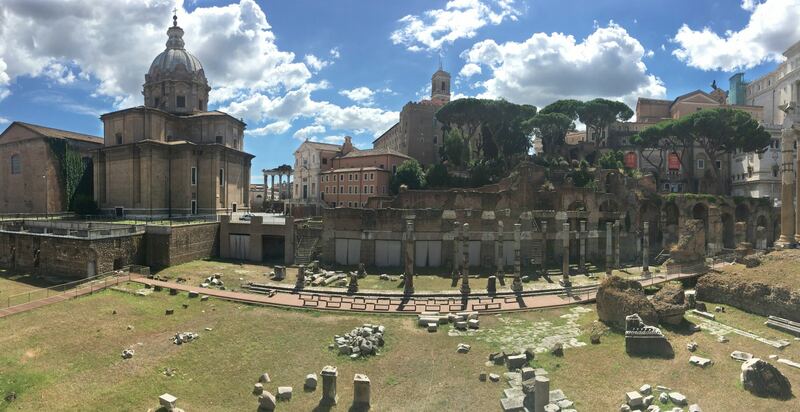 The Roman forum feels very cluttered and busy, full of ruined structures – and that’s because it was! It was developed gradually over many centuries, resisting any attempt to impose order, with public buildings crowding the central square. Every time the debris in the streets got too much, they just paved over the top of it, leaving layers of rubble for modern archeologists to find. Left: Chilling out with the Tabularium and Arco di Settimio Severo in the background. Right: The forum from the South. One of the key roles of the forum in ancient Rome was to host triumphal processions from returning victorious generals, who would enter the city via the Porta Truimphalis, lap Palatine Hill and then continue down the centre of the Forum before climbing to the summit of the Capitol where the Temple of Saturn stood. This, naturally, would be followed by a public banquet. Left: Basilica di Santa Francesca Romana. Right: Walking up to Palatine Hill. Left: The view north from Palatine Hill. Right: The view south from Palatine Hill. 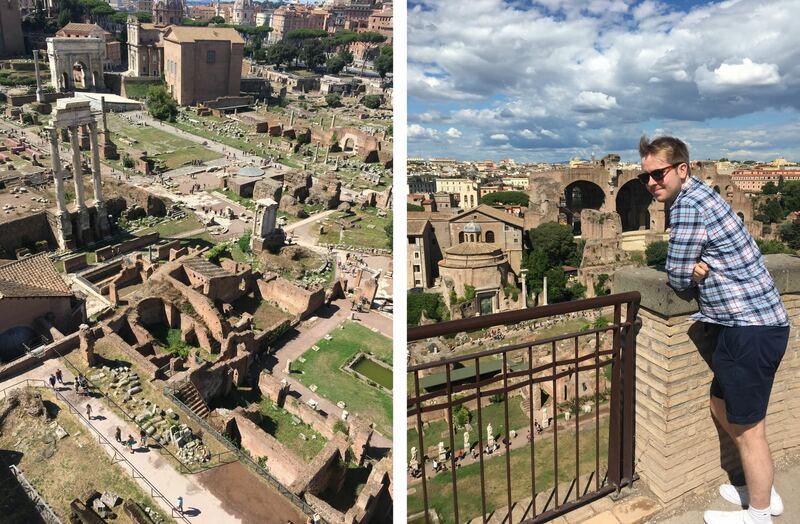 The viewing platform on the top of Palatine Hill is easily the best place to appreciate the Roman Forum. 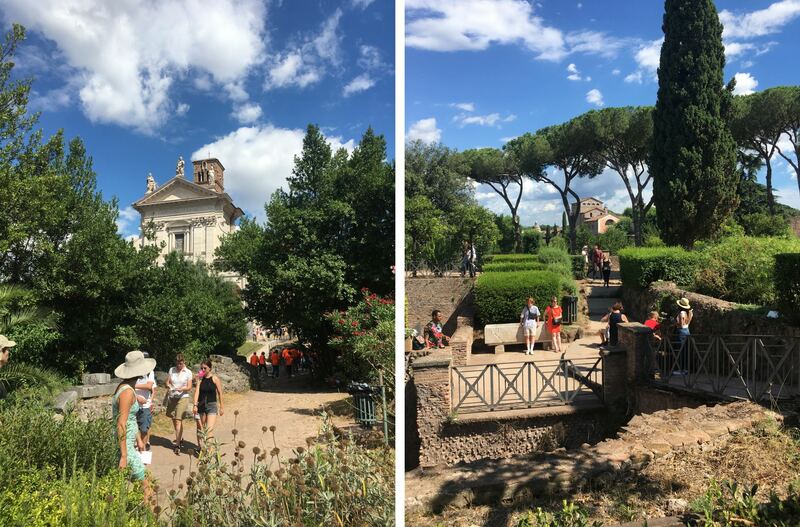 If you stand at the corner of the railings you’ll have the entire area laid out before you, sweeping from the ruined Temple of Saturn all the way down to the Basilica di Santa Francesca Romana, where you can see the Colosseum lurking behind the trees. This view was my personal highlight of the day and is absolutely not to be missed. Looking down from Palatine Hill. Before you leave the Roman Forum, make sure you visit the Piazza di Santa Francesca Romana for the best view of the Colosseum. 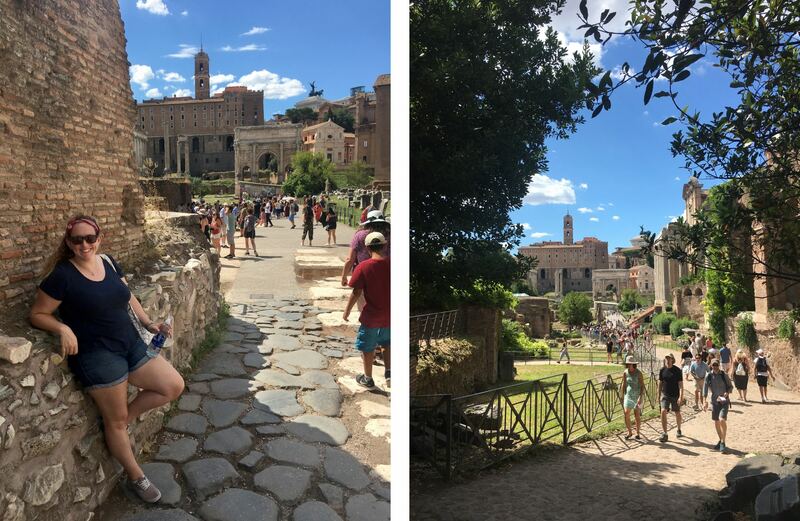 Pass by the Arco di Tito, follow the path to the right of the Antiquarium Forense and around the Temple of Venus and you’ll get to a plateau of grass overlooking the Piazza del Colosseo. There’s no shortcut down from here, so don’t even try it, but the detour is totally worth it for some great snaps without the crowds. The view of the Colosseum from Piazza di Santa Francesca Romana. To actually get to the Colosseum you have to go back into the forum and follow the signs to the exit. Top tip: If you’ve bought a joint ticket for the Roman Forum and the Colosseum, this doesn’t mean you can skip the queue. The only way to do this is book a timed slot online beforehand. Queuing around the sides of the Colosseum. Built in 80 AD, the Colosseum is the largest amphitheatre in human history. During its heyday it could hold between 50,000 and 80,000 people, most famously for gladiatorial contests but also for animal hunts, executions, battle reenactments, and dramatic performances, right up until early medieval times. Since then it’s been used as a fortress, a quarry, a Christian shrine, a fictional stage for the Italian Music Awards in the Lizzie McGuire Movie, and nowadays as the start of a Good Friday torchlit procession by the Pope. 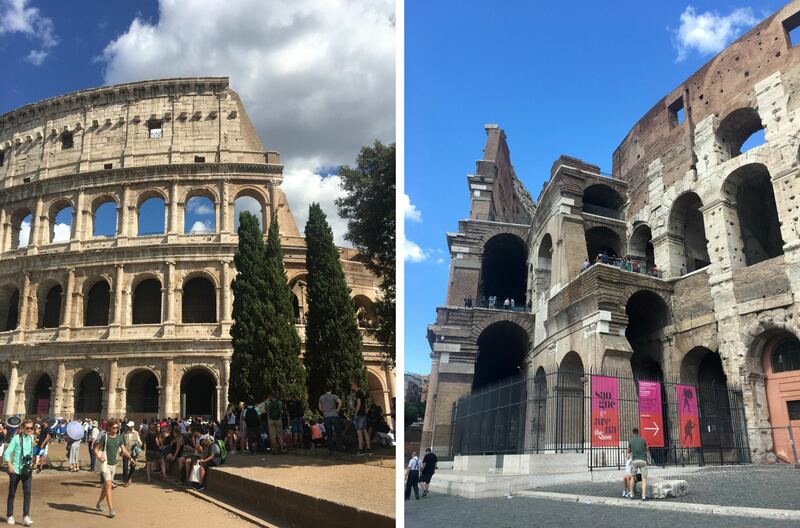 Left: Entering into the Colosseum. Right: The view over the underground cages from the ground floor. 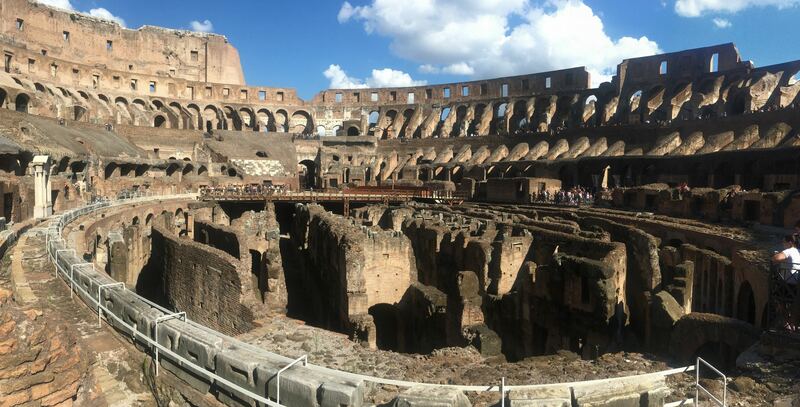 The inside of the Colosseum, with its oddly skeletal appearance, is definitely impressive. If you want to view it without jostling for space at the railings you probably want to time your visit for early morning or even off season, but even surrounded by tourists you’re still sure to be struck with the sheer size of this space, the stands swooping around and arching off into what feels like the far distance. Can you imagine how exciting it would have been to watch something here? Panoramic of the underground cages, where slaves and animals alike were kept, as well as Christians and criminals before executions. Now the walk from the Colosseum back up into the centre is not to be sniffed at, it’s a good 20 minutes which in the Italian summer sun can feel much longer than that. We definitely needed a break before the rest of our itinerary, so we stopped at a restaurant and ordered our beers and cokes. Another stand out monument from our day, the Trevi Fountain is a stunning structure that actually left some of us totally bowled over. For me the best part was the colour scheme, the white marble of the fountain reflecting the turquoise water below, offset by the warm glow of the setting sun against the pastel peach buildings around the square. Beaut. 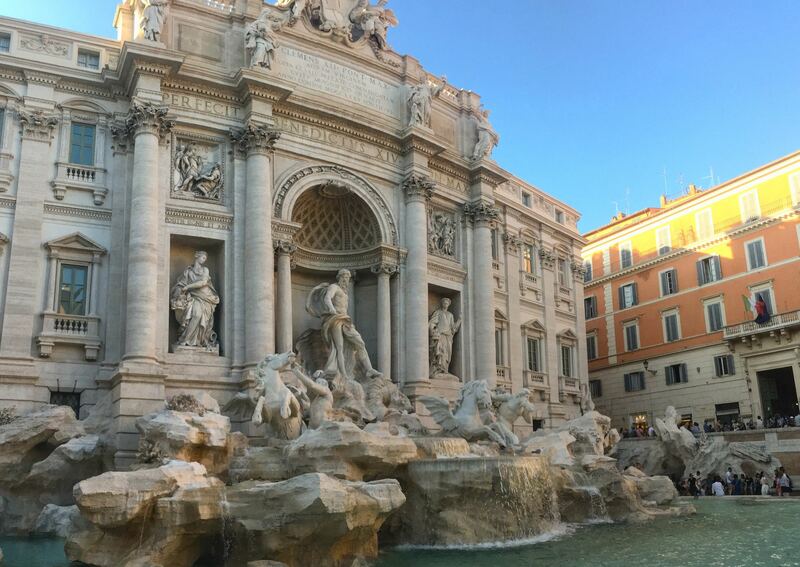 Built in 1762 and named after the district of Rome that it stands in, the Trevi Fountain is the largest Baroque fountain in the capital and one of the most famous in the world, appearing in films like La Dolce Vita and Roman Holiday. 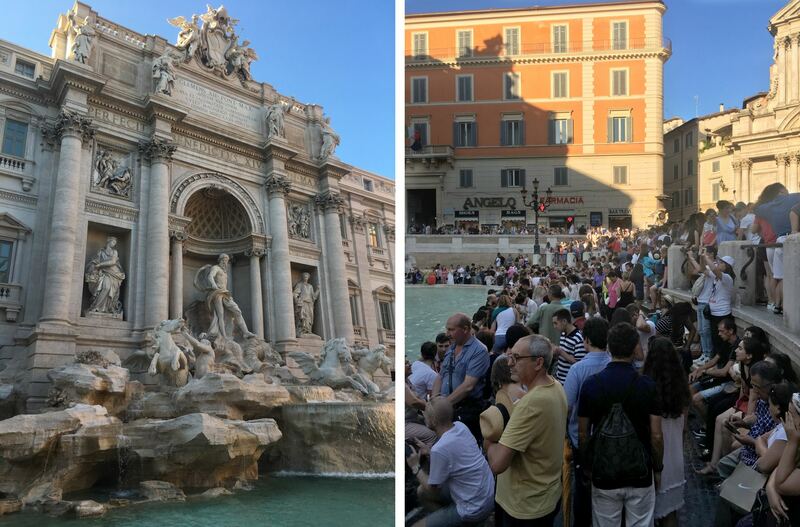 The facade of the fountain tells the story of ancient Roman technicians who located a source of pure water 13km outside the city, apparently with the help of a virgin (virgins are so handy aren’t they?). 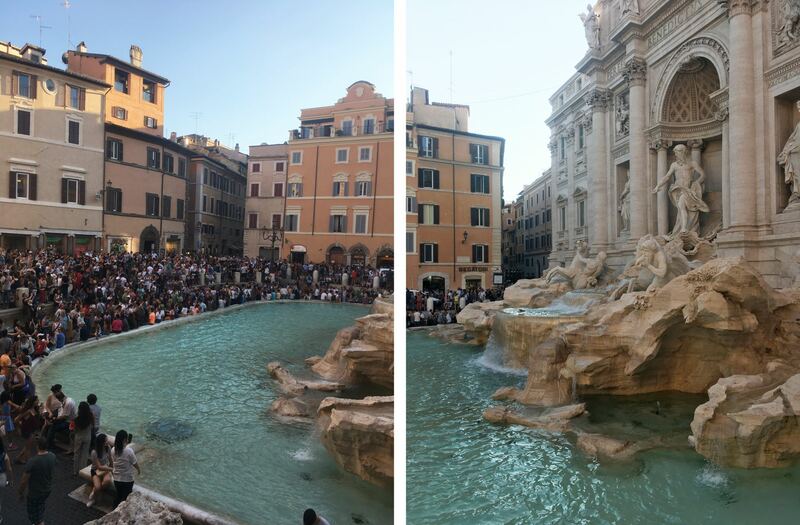 The fountain has to be restored every ten years or so because of discolouration from smog. The latest restoration in 2015 was sponsored by fashion brand Fendi and cost €2.2 million. The church in the corner of the square is called Santi Vincenzo e Anastasio. 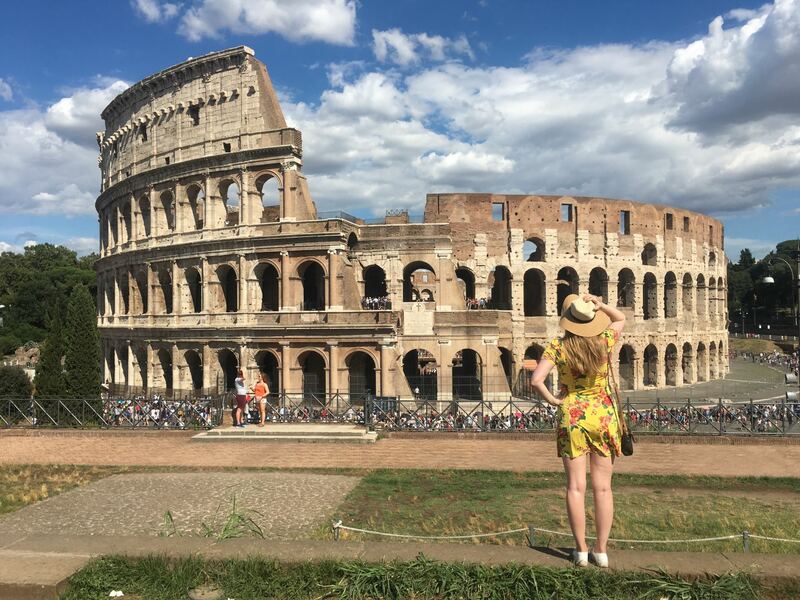 Legend has it that if you throw a coin over your left shoulder with your right hand, you’ll be sure to return to Rome one day. Because of this around €3,000 is thrown into the fountain every day, and the money gets used by charity to fund supermarkets for people in need. The facade of the fountain from the North West corner. As you can see from my photos, the square around the fountain is HEAVING with people. To get your chance to throw your coin from the edge you’ll have to hover around until someone vacates their spot – although that doesn’t actually take too long because everyone’s there to do the same thing. If you want beautiful shots of the fountain without the crowds, be prepared to get up very very early. 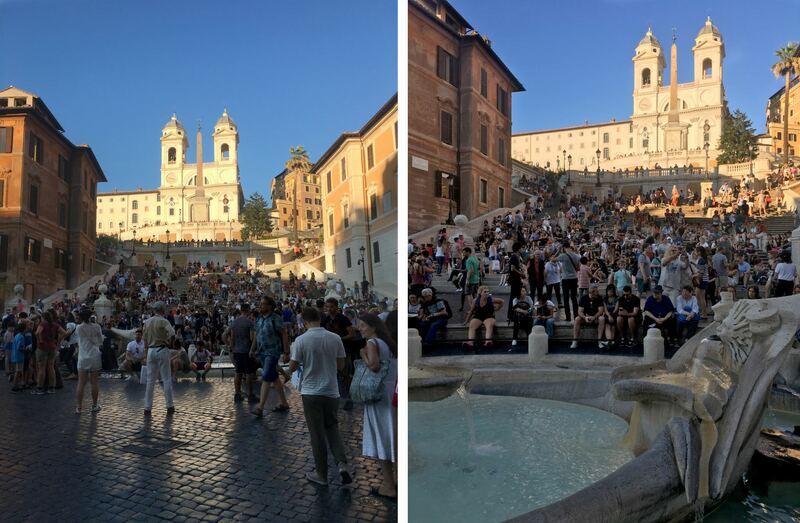 The Spanish Steps connect the Piazza di Spagna which is the site of the Spanish Embassy, to the French Trinità dei Monti church on top of the hill. 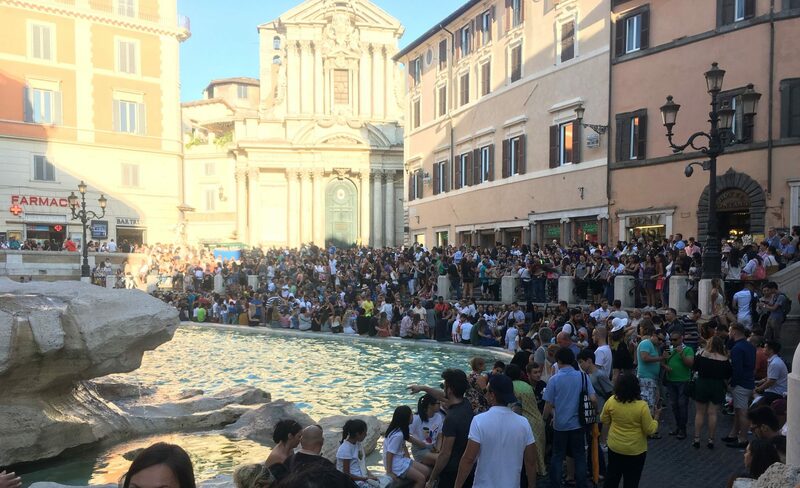 It’s another filming location from Roman Holiday, so you can thank Audrey Hepburn for the crowds here too. 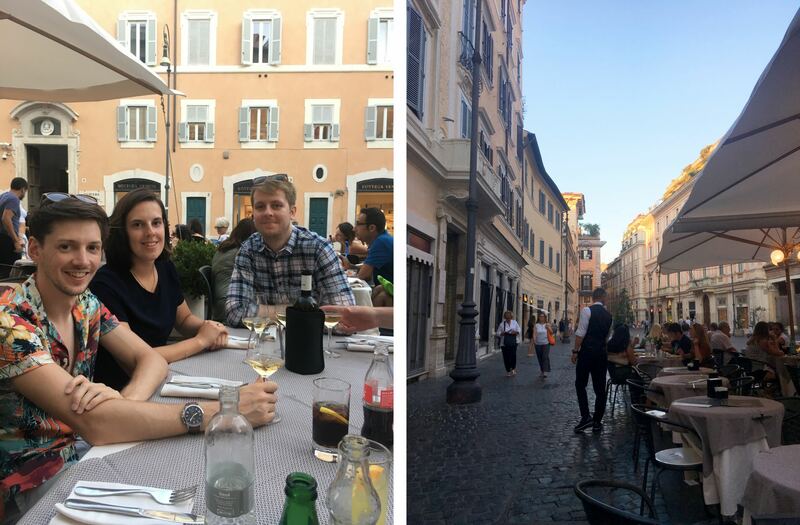 Top tip: We came into the Piazza di Spagna from Via di Propaganda, but a better way to approach is down Via delle Carrozze, so that you walk into the square face on. The Spanish Steps from Piazza di Spagna with the Fontana della Barcaccia in front and the Trinità dei Monti church at the top. On the right of the steps is the house of English poet John Keats, where there is now a museum dedicated to English Romantic poetry. That leaves you two hours left in Rome for dinner! Time to explore the streets and find somewhere to eat. Hungry after a hot and tiring day. Unfortunately because we were in such a big group we had to be quite diplomatic about where we chose, and I hate to say it but we ended up in a bit of a tourist trap with a pretty mediocre menu. If you want the best, look for the busiest restaurants with locals queuing up waiting to be seated. If it has a set menu with only three or four dishes, even better. 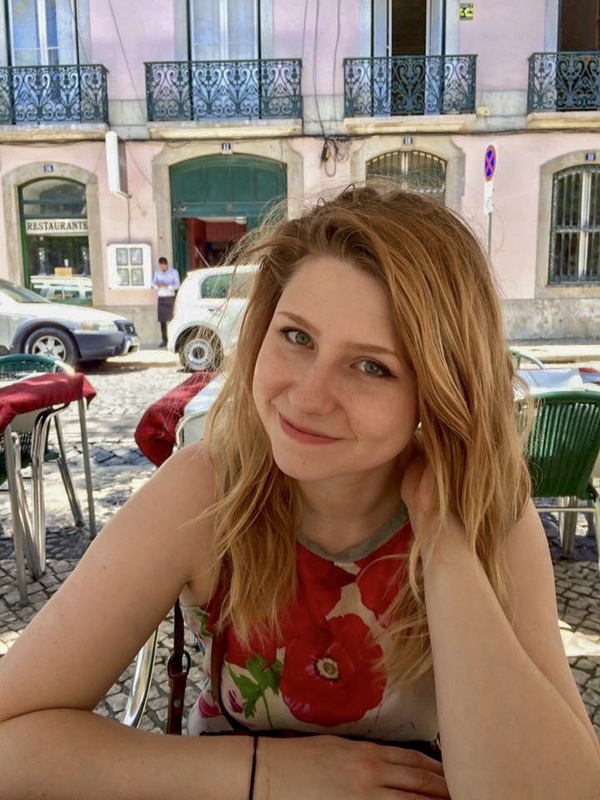 Rome is fantastic, I can’t believe it took me so long to visit it properly! I’ve never been anywhere so saturated with history, and so guilded with beautiful places to visit. I only wish I could have stayed longer to see some of the less obvious sights of the city. If I were to do it again, I would freeze my water bottle beforehand so it stayed cold for longer (something I learned from Emma), I would book a timed visit at the Colosseum, and I would have researched restaurants for us to have dinner at, because as much as Matt and I love wandering around new places and stumbling across great eateries, you just can’t expect to do the same when you’re in a big group. Think this post is missing a visit to the Vatican? Read my other post from the trip, Inside Vatican City.